This large-print tract is aimed at the older generation as it recalls significant historical events and leads right into the gospel presentation. Do you remember how America wept when President Kennedy was shot? Do you recall how on July 20, 1969, Neil Armstrong landed on the moon, and we heard the immortal words, “That’s one small step for man but one giant leap for mankind”? How the years have flown by. Time has been called our “greatest commodity,” and yet, it rules supreme over us all. Perhaps its greatest display of power is evidenced by its ability to reveal the mortality and frailty of human nature. Even in the lives of its most prominent figures, history bears witness to the powerful effects of time. 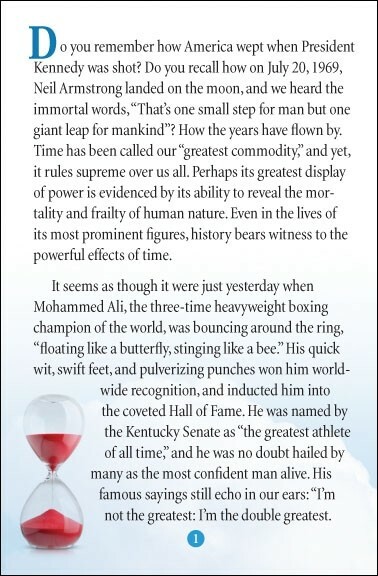 It seems as though it were just yesterday when Mohammed Ali, the three-time heavyweight boxing champion of the world, was bouncing around the ring, “floating like a butterfly, stinging like a bee.” His quick wit, swift feet, and pulverizing punches won him worldwide recognition, and inducted him into the coveted Hall of Fame. He was named by the Kentucky Senate as “the greatest athlete of all time,” and he was no doubt hailed by many as the most confident man alive. His famous sayings still echo in our ears: “I’m not the greatest: I’m the double greatest. Not only do I knock ’em out, I pick the round.” “I am the astronaut of boxing. Joe Louis and Dempsey were just jet pilots. I’m in a world of my own.” “I’m a baaaad man!” “I’m the king of the world.” It appeared that “the Champ” was simply invincible, until we all blinked and suddenly found him a frail and ailing man, suffering from the advanced stages of Parkinson’s Disease. Those hands that he once launched at his opponents, like satellite-guided missiles, began to shake uncontrollably. The rapid-fire one-liners were reduced to slowly spoken three-word sentences, and the unforgettable dancing feet no longer moved quite like they once did. 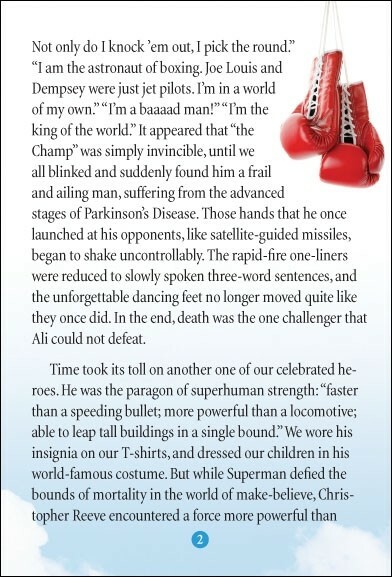 In the end, death was the one challenger that Ali could not defeat. Time took its toll on another one of our celebrated heroes. He was the paragon of superhuman strength: “faster than a speeding bullet; more powerful than a locomotive; able to leap tall buildings in a single bound.” We wore his insignia on our T-shirts, and dressed our children in his world-famous costume. But while Superman defied the bounds of mortality in the world of make-believe, Christopher Reeve encountered a force more powerful than Kryptonite in the real world. It was as though we looked away for a brief moment, and when we looked back, we found America’s greatest superhero reduced to the stature of a mere mortal. 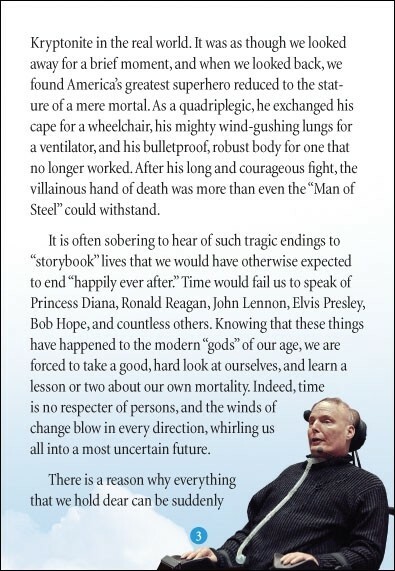 As a quadriplegic, he exchanged his cape for a wheelchair, his mighty wind-gushing lungs for a ventilator, and his bulletproof, robust body for one that no longer worked. After his long and courageous fight, the villainous hand of death was more than even the “Man of Steel” could withstand. It is often sobering to hear of such tragic endings to “storybook” lives that we would have otherwise expected to end “happily ever after.” Time would fail us to speak of Princess Diana, Ronald Reagan, John Lennon, Elvis Presley, Bob Hope, and countless others. Knowing that these things have happened to the modern “gods” of our age, we are forced to take a good, hard look at ourselves, and learn a lesson or two about our own mortality. Indeed, time is no respecter of persons, and the winds of change blow in every direction, whirling us all into a most uncertain future. There is a reason why everything that we hold dear can be suddenly stripped away. There is an answer to why our every heartbeat is the drumbeat to our own funeral march, and why our lives upon this earth will forever be at the mercy of the cold hand of death. 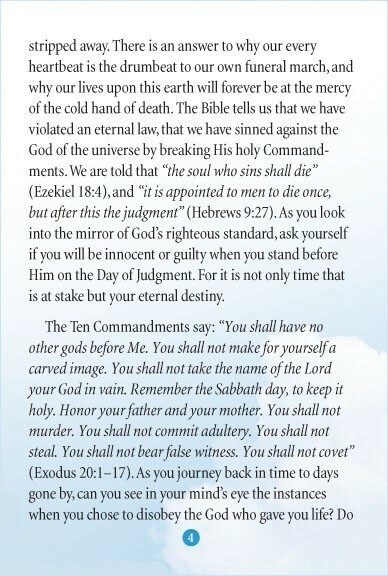 The Bible tells us that we have violated an eternal law, that we have sinned against the God of the universe by breaking His holy Commandments. We are told that "the soul who sins shall die" (Ezekiel 18:4), and "it is appointed to men to die once, but after this the judgment" (Hebrews 9:27). As you look into the mirror of God’s righteous standard, ask yourself if you will be innocent or guilty when you stand before Him on the Day of Judgment. For it is not only time that is at stake but your eternal destiny. The Ten Commandments say: "You shall have no other gods before Me. You shall not make for yourself a carved image. You shall not take the name of the Lord your God in vain. Remember the Sabbath day, to keep it holy. Honor your father and your mother. You shall not murder. You shall not commit adultery. You shall not steal. You shall not bear false witness. You shall not covet" (Exodus 20:1–17). As you journey back in time to days gone by, can you see in your mind’s eye the instances when you chose to disobey the God who gave you life? Do you remember those moments when instead of speaking words of truth, you fabricated lies and uttered falsehoods? Do you recall the times when you reached out your hand in greed and covetousness to steal the things that belonged to others (regardless of the value or how long ago it was)? Be honest with yourself, because nothing you’ve done has ever escaped the notice of the God before whom all things are open (Hebrews 4:13). According to His holy standard, if you have ever looked with lust, you are guilty of adultery (Matthew 5:27-28). If you have used His name in vain, you are a blasphemer. If unjust anger or hatred has ever welled up in your heart toward another, then you are considered a murderer (1 John 3:15). 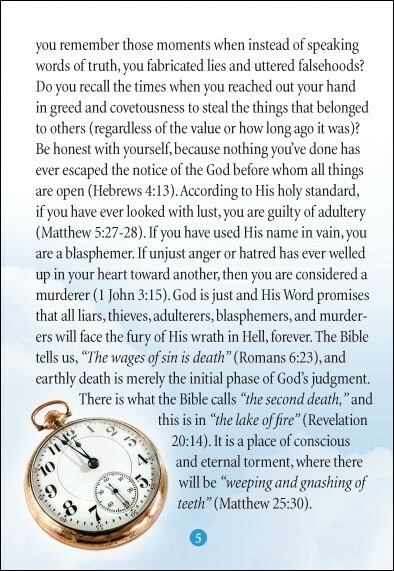 God is just and His Word promises that all liars, thieves, adulterers, blasphemers, and murderers will face the fury of His wrath in Hell, forever. The Bible tells us, "The wages of sin is death” (Romans 6:23), and earthly death is merely the initial phase of God’s judgment. There is what the Bible calls "the second death,” and this is in "the lake of fire" (Revelation 20:14). It is a place of conscious and eternal torment, where there will be "weeping and gnashing of teeth" (Matthew 25:30). Although we are all deserving of condemnation, God in His infinite love and mercy has made it possible for people to be saved. About two thousand years ago, He sent His Son to this earth, in the person of Jesus Christ. Jesus lived the perfect life on behalf of undeserving sinners, and willingly took their place by suffering and dying on the cross for their sins. He then rose again on the third day, in fulfillment of numerous biblical prophecies, and was seen by hundreds of eyewitnesses after His resurrection. 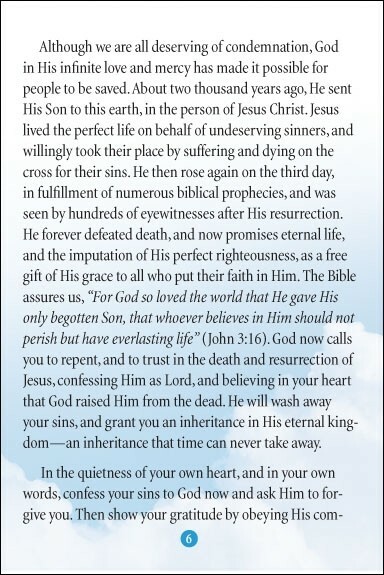 He forever defeated death, and now promises eternal life, and the imputation of His perfect righteousness, as a free gift of His grace to all who put their faith in Him. The Bible assures us, "For God so loved the world that He gave His only begotten Son, that whoever believes in Him should not perish but have everlasting life” (John 3:16). God now calls you to repent, and to trust in the death and resurrection of Jesus, confessing Him as Lord, and believing in your heart that God raised Him from the dead. He will wash away your sins, and grant you an inheritance in His eternal kingdom—an inheritance that time can never take away. In the quietness of your own heart, and in your own words, confess your sins to God now and ask Him to forgive you. Then show your gratitude by obeying His command to be baptized. Be sure to also join a fellowship of believers in a Christ-centered church and commit yourself to the study and obedience of His Word, the Bible. Thank you for taking the time to read this. 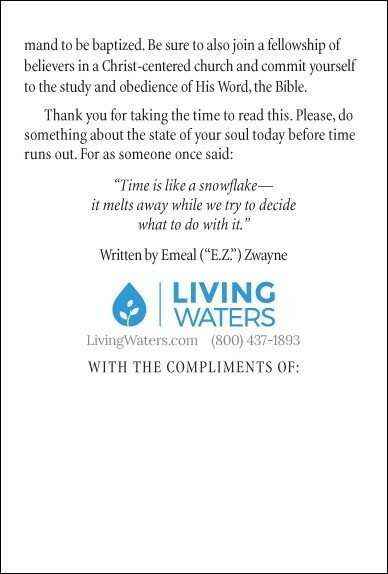 Please, do something about the state of your soul today before time runs out. For as someone once said: "Time is like a snowflake—it melts away while we try to decide what to do with it." At first, I thought that the length of info in this tract would be a hindrance in getting people to read it. Instead, the attractiveness and clarity of the gospel is very effective. Seniors especially enjoy this tract.